Kids pressing your buttons? Have them PRESS HERE instead. So there we are, at the library. My son, who is 3, already likes to wave goodbye to me at the metaphorical corner. We enter the puppet theatre and he runs to the front row, squeezing between the kids so that he’s in the front and center, leaving his mom and baby brother to find room in the back. The wave, actually, is as metaphorical as the corner: Once inside the theatre, he never looks back at us. Nashville Library storytime is the best kids activity I’ve ever been to, and, as my husband and I discuss where to move, tops the list of “pros” that Nashville has to offer. (Not that there aren’t other good “pros”; just that it’s that good). Anyway, I’ve been introduced to a lot of great books at storytime, and this is one of them. It’s interactive reading at its best! In Press Here, you are supposed to do just that. Press the yellow dot on the front of the book and find out what happens. Turn the pages, and something DOES happen! Another dot! And then more! And sometimes they change colors! Shake the book and turn the page—and the dots are suddenly all over the book, not in a neat and tidy row. Turn the book to its side, then turn the page again. The dots all fall to the bottom! This book will make you and your toddler or preschooler laugh. It will make them interact with their reading. Play with your books! It’s the new way to honor them! Finding the right name for your children is an involved process. Did you see the Pregnant in Heels episode (not that I watch, of course) where the couple used a think tank, a focus group, AND a dinner party to judge reaction to baby names? And then chose the name they liked (Bowen) even though no one in any of those groups liked it? I loved that—baby names are personal…that’s why no one tells until the baby is born. Once the name is on a kid, no one can insult it…until that kid goes to school, that is. For us, we thought about how the name sounded, what it meant, and where it came from. We definitely wanted a family name. Children, after all, are about as Darwinian as it gets, and in ensuring the continuation of my genes, it was important to me to honor those who carried these genes in previous lifetimes. As soon as we learned we were having a boy, I got out the family trees. I typed every male name into a document and we narrowed it down to a list of the final four names—-and then kept changing those every few weeks. When we decided, it seemed obvious. We liked the sound of the name, Jacob. We liked the symmetry of the ancestry—Jacob was a great grandfather to my husband and my older son was named after a great grandfather to me. Most importantly, we liked the idea of honoring this person, and this person’s family, by giving his name to a new member of our family. The name hadn’t been on our top lists for the simple reason that it was so high up on the nation’s list. I had really wanted something more unique. But we decided to go with the name we thought was right for us, and if he had a few friends named after the Biblical character, well, that would be okay. But here’s the thing: my dad called recently to say that he read an article that said Jacob was a popular recent name, not because of grandparents, Bibles, or Torahs, but because of Twilight. Because of the Native American werewolf. My husband is now threatening to tell everyone that we named our son after Taylor Lautner. Werewolf or no, Jacob is our little Jacob and when I say his name I think about my grandmother-in-law and the father she once had. And I’m so glad that in some small way, he lives again. Which brings me, rather long-windedly, to a personalized book that I will read to teach Jacob his name. The wonderful folks at Marblespark gave me a free copy of their books (with my son’s name!) so that I could see their work and share it with you. I’m excited to do that here. This book makes a great baby gift. Each page adds another letter of the name, which spells itself out at the bottom of the pages as you read the book. With each letter is an illustration of animals on an adventure in a different part of the world (that starts with that letter). For example, the J in Jacob gives us this page: “A stop in Japan offers jillions of J’s. / Just watch out for jellyfish in all of its bays.” Or the C gives you “Next we need a C so Cairo’s where we’ll stop / And listen as the camels go clippity-clop-clop.” As you read the story, you travel the world picking up the letters to spell your child’s name. The illustrations are my favorite part–they are beautiful with soft colors and a great sense of humor. One of the cool things about creating this book online is that not only are you personalizing each page by the letters in your baby’s name, but you have choices for each letter. For example, if there is a C in the name, you can choose Cairo or Chile, among others. As you create the book online, it shows you the page, tells you what the other options are and if they are used already elsewhere in the book and lets you decide the trip your child will take to pick up his letters around the world. Adding a middle name is an extra few dollars, and when they gave me the code, they actually recommended that I not do so because it lengthens the book so much. This is true, and we ended up with a pretty long book, but I’m not really reading this only as a story; I’m reading this so he can see the wonder of his name, and I wanted all of that to be there. If you read this blog at all, you know that I like books that encourage kids to interact with them. 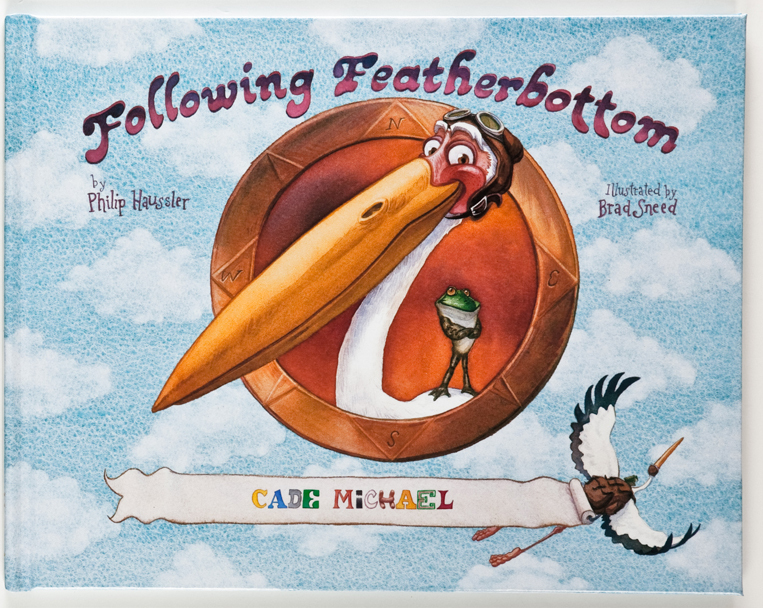 Not only does this book encourage your child to think about his name and learn the spelling, watching the name appear across the bottom of the page, but it introduces letters in other ways as well. Each illustration contains items that start with the corresponding letter, which are written next to the picture. You and your child can search for the items, practicing out loud how to say them, emphasizing the sound of the first letter, which they will all have in common. Check it out at marblespark.com. While you are there, check out their community-built picture book project, a public book written by the masses that raises funds for charity at http://www.marblespark.com/blog/openbook. Congratulations Romelle! You won a great picture book, Lily Hates Goodbyes! I’ll be contacting you shortly to find out where to send it! If I could choose to pass only one thing down to my child, it would be good food. After all, we are what we eat. Our bodies are our temples, and so on and so forth. Modern science is finally catching on to what ancient traditions have always known—most of our problems will go away (or never appear!) if we eat well. Eating with my 3-year-old has been a constant source of concern for me. When he eats his veggies, I am so excited I have a hard time not showing it. Same thing when he doesn’t–I work hard not to show my disappointment. Like in a lot of areas of parenting, I spend a lot of internal energy making sure that my exterior is as cool as a cucumber. Based on what I read on the parenting websites and in the magazines, I try not to make meal time a power struggle or emotional fight. I don’t want to tell my kid he HAS to eat something because I don’t want him to refuse just to spite me. I don’t want to tell him he will get dessert if he eats something because I don’t want sugar to become the reward and vitamins the hard work you have to do to get the reward. Really, I just want to put the food in front of him and have him magically eat it up. Well, that happens sometimes. But there are also the times when he doesn’t eat it and I smile anyway and take his plate away. Or the times when I can’t help myself and I do tell him he has to have three more bites. Or the times when I persuade, argue and coerce him to try just one more thing. Or the times when I hold dessert out as the carrot, irony intended. So through a combination of tactics that parenting experts would both applaud and deride, I continue, as we all continue, as a mother of necessity. When I saw this book in the Owl Kids book catalog, I was really excited and requested it immediately. They sent me a review copy and I’m excited to spread the word. Yes, this book is about bread, and I’m sure you could debate the health factors of bread. But to me, this book touches on something much more important, something we have lost complete touch with: where our food comes from and how we make it. Because at the end of the day, if you are eating something you made with your own hands, instead of something out of a plastic package, then you’re a step ahead. And with childhood obesity hitting our country like an epidemic, it’s high time we all took those small steps with all of our children. Tangerine and Kiwi stay at their grandparents house and learn to make bread. They learn about the flour and water, the yeast and the salt. They hear stories about their Mom wh used to help make bread in the family bakery. They do the work themselves, bake the bread over a wood fire, and, best of all, eat it up. The illustrations are done in warm oranges and browns, which helps you visualize and almost smell the aroma of a warm loaf of bread. There is a recipe at the end of the book. The story is simple but the message is powerful. The more children understand what food is and where it comes from, they more they will be able to make their own healthy choices as they grow up. There’s only one thing to do: bake bread! The book even includes a recipe and directions. This is an activity that kids will love! Lots of mixing, kneading, and hands-on gooeyness. They will be really excited to see the dough after it’s risen—I can remember being so excited myself when my mom made her special rolls for Thanksgiving. And to this day, I get a lot of satisfaction from seeing that swollen mound in the bowl, just waiting for me to bake it and eat it. Thank you, Owl Kids, for the review copy! I really enjoyed the book! Is there anything more annoying than an alphabet book? I mean, yes, Q is for Quail and Queen. And yes, I get that xylophone starts with an X. Sure, some books manage to do things a little differently. I would have never learned about Umbrella birds or Question-mark butterflies without a two-year-old and an increasing pile of alphabet books. But I find most of them abhorrent and would issue this advice to anyone planning to write a new alphabet book: it’s not so much about the P’s and Q’s as it is about the X’s and Q’s. figure out what you are going to do with those letters first, and if you don’t have a truly great idea that really fits with what you are doing, write a different kind of book. But with this book, someone came along with a really good idea. 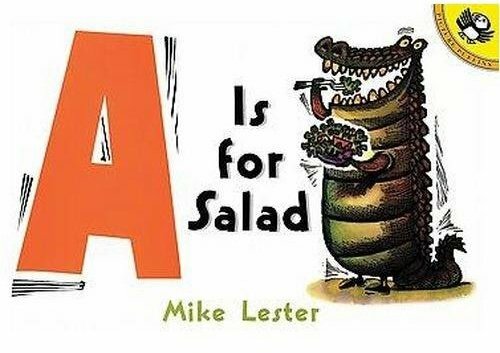 “A is for Salad”. I loved it before I even opened it. I was SO excited about this book! It does exactly what I want my picture books to do–draws my child into to the text and makes him respond out loud! In this beautifully conceived book, each letter of the alphabet seems to stand for something it doesn’t. A is for salad, B is for viking, C is for hot dog. But then you look closer. This is a book you have to interact with! (Yea!) The picture is of an alligator eating a salad. And a beaver dressed up as a viking. It’s brilliant. My three year-old loved it. He loved saying “WHAT? !” with an incredulous expression on his face after I read each one. And then he would respond with enthusiasm (and much drama–we are three, after all). “NO, A is not for SALAD,” he would say as if that were the funniest, most ridiculous thing in the world. “A is for ALLIGATOR!! !” And so on and so forth throughout the whole book. It was truly awesome. I’m always saying that you have to get your kids interacting with their books, and this one does it for you. It’s a really fun read, and gets kids to think about the letters instead of passively listen to them be recited. My only quibble with the book is the illustrations. Because of the way they are drawn, some of the animals are tricky to guess. Since the whole point is for the kid to say the name of the animal, I would rather if it was a little more clear. But no matter, and after one reading they will get it anyway. You will love this one and your kids will love interacting with it. Ever just wanted to explain yourself? As a mom, a date, a friend, or just a human? Smith magazine allows you to do so, and only requires six words! In fact, they mandate that it’s only six words, which is what makes it so difficult. They published a really popular book of six-word memoirs and now manage a website where anyone can publish their own–as many as they like. Well, the author ever so nicely provided me with a copy of this book to review (see my original post and review here) and then I asked her if I could give it away, since I thought it would be nice if it went to a family with military connections that could really use it. However, my son has since sat on it (unintentionally, I think) and it doesn’t look perfect anymore. SO, long story short, I’m still doing a giveway, but I will be buying a copy for you myself. You are welcome. This really is a great book, so definitely enter and encourage any families in the military you know to do so as well. Rules: You may enter one time for each of the following items. Contest is open to U.S. residents until May 20th at midnight in Nashville, TN. Winners will be notified by email after that as well as announced on the site (so make sure to check back and provide your email!) Winners will be chosen using random.org. 1) Mandatory entry: Just leave your email address or contact information. 2) Subscribe to this blog via email. 3) Subscribe as a WordPress user. 4) Follow me on Twitter (and leave me your handle so I know you are!). 5) Follow the blog on Facebook (search: the family that reads together). I’m lucky that I don’t have a personal story to go along with this book. And I’m lucky that there are others who are willing to take on that personal story, to send their loved ones far, far away to served our country. So I won’t tell my usual parenting yarn here. I’ll just thank those whose own parenting yarns involve, in the words of the main character of this book, “about a billion days” without a parent. Lily hates goodbyes. This is the sad but sweet refrain that gives rhythm to this beautiful book about the sacrifices American military families make when the military parent is away. The book is geared toward children of military personnel to help them deal with the pain of missing a parent for “about a billion days”. This book is really well written and beautifully illustrated with colorful drawings in a really accessible style. The goal of the book—to help young children deal with the long absences and unknowns of having a parent in the military—is clear, but unlike other books that are written with such a specific purpose, it doesn’t sacrifice anything to reach that goal. The writing is perfect, the verse easy to read and poignant. There are a few repeated refrains such as “a billion days” and “Lily hates goodbyes” that lend a sense of poetry to the prose. The story is easy to follow and filled with ideas of things other kids might try, such as looking at the moon and thinking about a faraway parent who can also see the moon, or creating a memory box with pictures to show the parent when he/she returns. This is one of those books that’s meant to be followed up on. I’ve often talked in this blog about how parents can talk with their son or daughter about the meaning of a book or a book’s character as a way to indirectly talk about real issues in their son or daughter’s life. Kid are often much more comfortable talking about things in terms of an imaginary situation. This book is a perfect example of how to do that. Kids who might be too scared to say that they themselves are sad can observe that Lily is sad. They can observe that she’s mad. They might then go on to say that yes, they know why she’s feeling that way because they have felt the same way she does. This is a book that can bring comfort, ideas, and most importantly, real conversation between parents and children. And promoting that is the reason I started this blog in the first place. The author also includes ideas in the back of the book for ways to get the most out of it. Learn more at lilyhatesgoodbyes.com. It’s a great find and I’m excited to recommend it to you! I’m also excited to be able to give away a copy! More details in tomorrow’s post!